REX’s unique capabilities include: multibody dynamics and autopilot to simulate maneuvers; course keeping, stability, and other problems in which several movable control surfaces are used to control the craft; advancing models for bubble entrainment and transport; modeling of seaways up to high sea states; etc. Pablo Carrica leads a research team at IIHR—Hydroscience & Engineering that developed REX, a computational fluid dynamics code that models the interactions between ships and water, supported by high-performance computing resources at the University of Iowa and the Department of Defense. 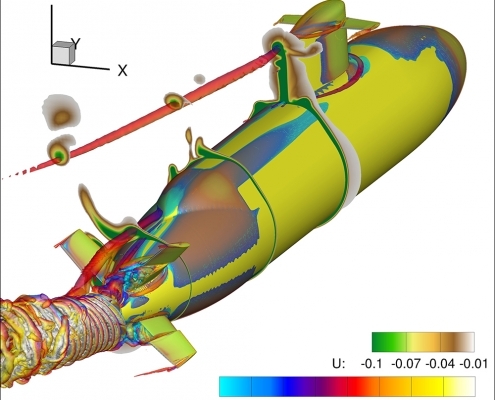 REX focuses on motion simulation and bubbly flows, modeling the movement of ships and submarines in dynamic and often turbulent marine environments, as well as their bubbly wakes and cavitation. Its strength, Carrica says, is its adaptability: “There are many, many applications, and many of these capabilities are unique in the world. We work with the Navy, trying to add capabilities that are useful for Navy applications.” Those applications tackle some of the trickiest problems in managing hugely expensive ships and aircraft and the seemingly unpredictable sea. Among the things REX can do is help to understand the nature of submarine and ship “bubbly wake”—the trail of tiny bubbles that extends behind a moving ship. The bubbly wake forms by entrainment of bubbles caused by interactions of the ship with the water and waves. These bubbles undergo complex processes of transport, breakup, coalescence, and dissolution, and then slowly rise and leave the water through the surface. The operation of the vessels — speed, maneuvers, etc. — strongly affects the bubbly wake generation process. Work with REX helps the U.S. Navy better understand the behavior of the bubbly wake.